Using small diameter dowels is an easy (and cheap) way to finish your wooden doll house stove, refrigerator, sink and cupboard. Here I used some scraps of grey dowels (torn out of an old drapery sample) for handles for the fridge and stove. And tiny snippets of thin dowels for the sink/cupboard faucet handles and drawer and cupboard handle. When the glue dries, paint these too. 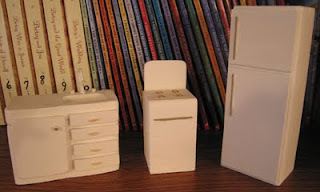 For a finished picture of the miniature sink / cupboard combo, see the picture in my later post.